This is the ready-to-go minimalist answer to the Cosmopolitan. 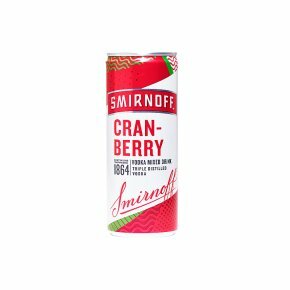 Smirnoff vodka is blended with the sweet tart tang of juicy cranberry juice to create a perfect party aperitif. Dress it up by serving in a frosted cocktail glass with a splash of Cointreau or pare it back and serve with just a twist of lime. Triple distilled. Premium no. 21 vodka.